Programs or shortcuts placed in the Startup folder will run automatically open whenever Windows starts. Follow the below steps to make a program run on windows startup. 1. Click the Start button and click Run...(or simply press Windows key + 'R'). 2. 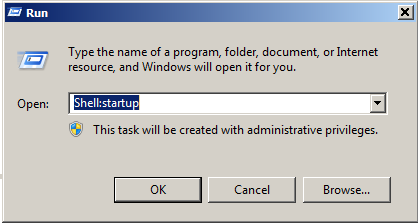 Type the command "Shell:startup" in the Run dialog, and press Enter. 3. Now, you can see the Windows Startup folder. 4. Open the location that contains the item to which you want to create a shortcut. 6. Copy the shortcut and Paste it into this Startup folder and Windows will automatically load them when you sign into your computer.